A great tasting and textured bread that has your Grandmother's bread bowl memories in every bite. Allow this mixture to sit for 5 minutes or longer. 2 1/2 cups of high protein, whole wheat flour. Add the flour 1/2 cup at a time, stirring 20 strokes each time. Add 1 1/2 cups more flour to make a stiff dough. It will double in size in about an hour. Punch it down to the original size, recover, and let rise again to double, about 30 minutes. Turn the dough out onto a board with 1/4 cup flour. Divide dough into as many portions as you have pans. I used an 8 mini pan tray and one antique pan from my grandmother's kitchen. Kneed the dough till its smooth and elastic. Grease the pans with shortening or butter (oil will make the bread stick to the pan). Dough should fill pans 2/3 full. Cover pans with clean towel and let rise for 30 minutes. 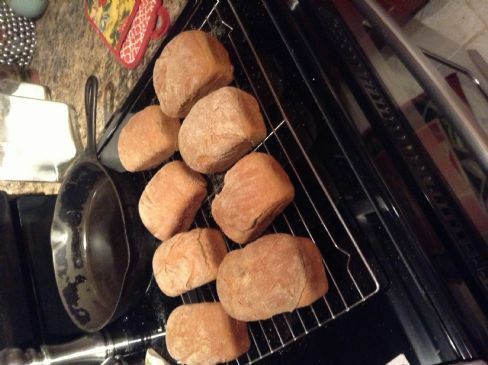 Cook mini loaves for 30 minutes at 350 degrees. Bake 1 pound loves for 50 minutes and 1 1/2 pound loaves for 70 minutes. Stirring & kneading well makes a good bread texture. Don't slack off or cut corners here! Recipe submitted by SparkPeople user REVCORNIE.